CLASH OF AGENTS AVAILABLE NOW! Hello agents! 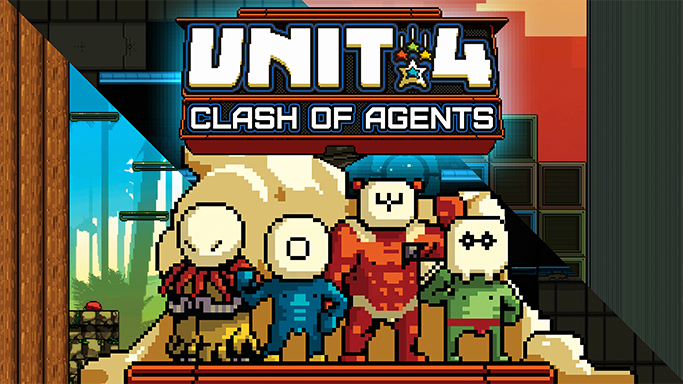 We are happy to announce that Unit 4 galaxy expands with the release of Clash of Agents DLC! The new add-on content is available now at 0.99€ on Xbox One and Steam and includes three competitive minigames for amazing challenges with your friends! Starting from today, you can finally play against your friends once you have done with aliens in the frantic arena of Nestiwal, surviving the deadly fights of Noxios IV or visiting Tamukame climbing for your life! If you want to know more, just read the full press release, download Clash of Agents screenshots or poke us at press@gameragames.net now. New tokens are available to review the game if you miss your chance with the original release. The DLC comes with various gameplay improvements, don't miss the chance to play one of the best action platform game of the year!